Winners of the 7/27 Dash 4 Cash! You are here: Home / Good Deal / Winners of the 7/27 Dash 4 Cash! A big thank you to everyone who participated in the 7/27 Dash 4 Cash! Be sure to join us for our next event on 7/29 (Friday) from 2-3 PM EST. 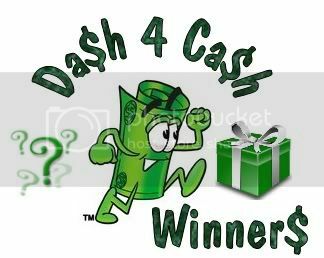 Here are the winners of the Dash 4 Cash giveaway that was held on 7/27/11! All winners should have been notified by email.